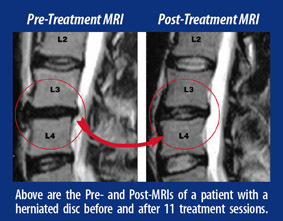 Non-Surgical Spinal Decompression Therapy – Is a Non Invasive Alternative for treating Herniated Disc and Spinal Joint Immobility. This therapy which is only available in a few clinics in Dubai, can help patients suffering from low back pain, herniated discs, bulging discs, sciatica, degenerative disc disease, facet syndrome and more, without the need for painful surgery or drugs. Our doctors use a combination of Chiropractic treatment, Physiotherapy, Massage therapy and Non-surgical spinal decompression therapy to help you to recovery. You have chronic or severe back or neck pain, herniated discs, degenerative disc disease, sciatica, and/or facet syndrome. You have had failed back surgery. You have been advised to consider surgery but you’re looking to a non invasive alternative. 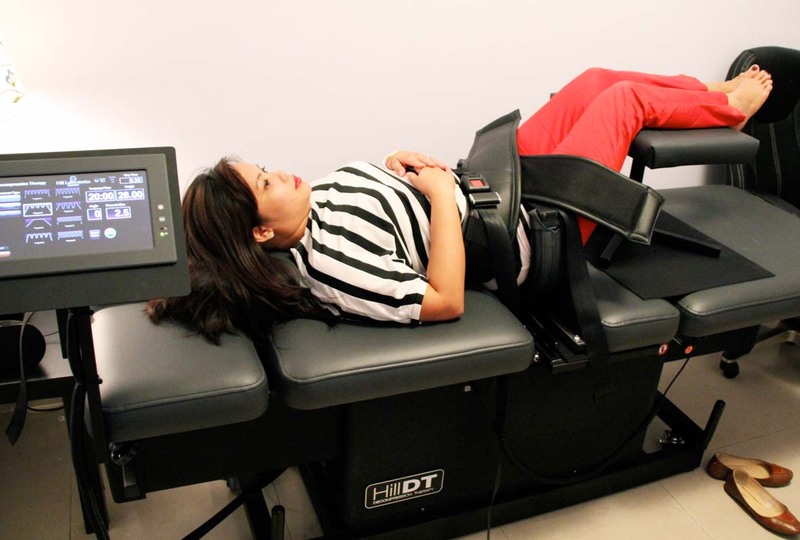 The patient lies on the Decompression table and a program is entered into the computer to target the exact spinal disc level or area in need of treatment. 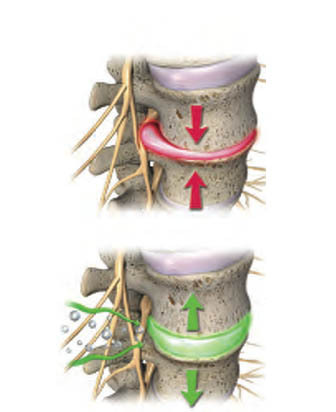 During treatment pressure can be created within the disc so that the negative material that has protruded or herniated can be pulled back within the normal confines of the disc. Most patients find the therapy to be quite comfortable and relaxing, some patients listen to music or fall asleep. During a 20 minute treatment most patients experience a gentle stretch in the lumbar spine as the table works at correcting spinal problems. Non-Surgical Spinal Decompression Therapy is designed to treat the cause of the problem, not just the symptoms. The benefits of non-surgical spinal decompression therapy is that it is a non-invasive, non-surgical, drug-free alternative treatment which has been proven to work in a high number of patients. Research has shown that a course of 20 sessions can provide long term recovery, enabling the patient to return to an active pain free life. Many patients report a reduction in pain after the first few treatments, this is a sign that the treatment is working but it is important to follow through and complete a full course of 20 sessions to increase your chances of long term recovery. Stopping the treatment early may result in a relapse as well as wasted time and money. Watch this video of Dr. Gerry Nastasia explaining the procedure of Decompression. To book an appointment call our clinic on 04-3481166.